The price translates into about RM2,200 per sq ft, indicating that the property market in the Kuala Lumpur City Centre area is still firm. Dijaya Corp Bhd, a property developer, is buying the land in Jalan Ampang on which the historical Bok House used to sit for RM123 million cash. The price translates into about RM2,200 per sq ft (psf), which is slightly below the RM2,588 psf that Sunrise Bhd paid last year for the land where Wisma Angkasa Raya is located. The price also means that the property market in the Kuala Lumpur City Centre (KLCC) area is still firm. "I think it's a good indication for the market. It's a positive sign," Zerin Properties founder and chief executive Previndran Singhe said. Dijaya, famous for its Tropicana branded properties, is likely to build expensive units on the prime land, a stone's throw from the Petronas Twin Towers. "It will also create an opportunity for the group to venture into the high-end property market given that available development land within the KLCC area is scarce," it said in a statement to Bursa Malaysia yesterday. Dijaya has paid the 10 per cent deposit to the seller, Mercury Property Management Sdn Bhd. However, there are two private caveats, a legal instrument that stops any development on the land. The first caveat was lodged by Ideal Sierra Development Sdn Bhd. Dijaya will pay the balance two months after the Ideal caveat is cancelled or by February 24 next year. It will use internal funds and loans to settle the purchase. The 55,929 sq ft land, which sits between Angkasa Raya and Wisma BSN in Jalan Ampang, is where tycoon Chua Cheng Bok built his mansion in 1929. Historians and conservationists had opposed the demolition of Bok House in 2006, considering it a national heritage and tourist attraction. Chua, who initially ran a business repairing bicycles and carriages, was the founder of car distributor Cycle and Carriage, which distributes Mercedes-Benz cars in the country. An office premise to be built by Emkay Group via Joyful Getaway Sdn Bhd will be the first building in Malaysia to be accredited with the internationally recognized Leadership in Energy and Environment Design (LEED) GOLD certification. The RM120 million project which involves the construction of a 323,000 sq ft building, will also mark the first green building in Cyberjaya. Emkay Group chairman Tan Sri Mustapha Kamal told a press conference in Cyberjaya today said that the building would be leased out to Shell Shared Service Centre (SSSC). Having a green building, he said, would not only increase the asset value of the property but also lower the operational cost through conservation of energy and water. "The move towards green building is very important as it is going to provide a healthier and safer environment for the occupants. "Green technology is the way of the future. It will change not only your approach towards the design and construction of property but also in the way we occupy and manage property," he said after the signing of the lease agreement between Joyful Gateaway and SSSC Kuala Lumpur Sdn Bhd. Shell Malaysia chairman Datuk Saw Choo Boon said the signing of the lease agreement confirmed a planned change in Shell Malaysia's physical footprints. The completion and occupation of the building by 2011 and the same of its accomodations in KL Sentral by 2012 would be the outcome of a rigorous evaluation process that is based on Shell's technical, environmental, social and financial requirements, he said. "With these two offices, Shell businesses and service centres in the Klang Valley will occupy only two premises from the 10 physical locations today. "This move will enable us to find synergies and cost savings through economies of scale. We will also be able to gain greater collaboration, thus the ability to respond faster to the needs of the customers in the region," he said. The Cyberjaya building will have five levels of office space and three levels of sub-basement for car parking. The original concept for the building was based on two individual office blocks flanking a central courtyard. However, due to the end-user's requirement, it has morphed into a U-shaped building where the connection between the two blocks are provided at the rear, thus maintaining the look of two separate buildings from the front. DNP Holdings Bhd, a property developer and garment manufacturer, said there was no valuation carried out on the 9.4-acre land it plans to buy for RM56 million, as it was a “willing buyer, willing seller” transaction. The company, part of the Wingtai Asia Group, added that the funding for the land as well as the development of the land, will come from internal generated cash as well as bank borrowings. It is not expected to have a significant impact on its gearing. PEACE with the environment is a criteria for healthy homes and every resident should create a balanced surrounding so that his or her mind, body and soul are in harmony. 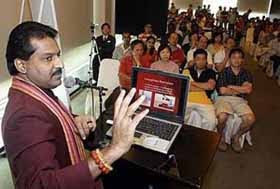 “This is important because we all experience physical and mental stress every day at work and returning to a home that is not in tune with the environment can add to the stress,” said Sunday Star Vasthu Sastra columnist T. Selva, who will be presenting a talk at The Star Property Fair tomorrow at the Kuala Lumpur Convention Centre (KLCC) Hall 4, at 2pm. Full attention: Selva delivering a talk on Vasthu recently. He said Vasthu, better known as Indian feng shui, essentially helps balance the man-made environment with the natural world. Selva said Vasthu was a science of architecture and it could be applied in any space, enclosed or open, and it is highly recommended when buying, renting, building or designing a property. “When renting or buying a new or second-hand house or apartment, Vasthu recommends that one should check certain things before making a decision. “The first thing one should do is to enter the property and stand in the centre with eyes closed to feel the ‘vibrations’. “If the vibrations make you feel happy, then check the directions by using a compass in which various elements of the house face,” he said. He said a potential house buyer should check which side the plot faced, the location of the roads, topography, plot extension and the surrounding area before making a commitment. “A house facing north is favourable as it is on the magnetic axis and welcomes positive energy. Land sloping towards the north is also considered auspicious. “A house facing south is average for residential purposes but auspicious for people in the food and beverage business. Land sloping towards the south is considered inauspicious,” he said. Selva, who has written two books on Vasthu, said a house facing east was auspicious because it received solar energy and if the land was sloping towards the east, it was considered auspicious. Selva said out of the eight compass directions, the only direction that should be avoided for a main door was the south-west. On buying a plot of land, he said do not buy a plot of land that has a graveyard either in front or at the back of it. “Such surroundings will only bring fear and give no peace of mind to the owner. “Buying land near a place of worship should also be avoided, especially if the shadow of a temple falls on the property.” he said. The call by Kuala Lumpur mayor Datuk Ahmad Fuad Ismail encouraging community involvement in the care and maintenance of city parks, playgrounds, and roundabouts has drawn favourable response from the public as well as corporations. Many see it as an excellent way for the DBKL to save costs as well as to instill a sense of belonging among Kuala Lumpur residents. Brickfields RT chairman S.K.K Naidu said it would also provide a means for the RT to earn money for its community activities. Good idea: The Brickfields RT is keen to adopt the Chan Ah Tong field in Brickfields. “It’s a great idea. Our members are seniors citizens and gardening would keep them occupied. It would also help give them a sense of purpose,” Naidu said. He added that the Brickfields RT would love to adopt the Chan Ah Tong field in the township and ensure that it was kept clean and maintained for the residents. Ramli Shahril, who lives in the government quarters in Jalan Rozario, Brickfields, said the idea was good and that apart from ensuring the parks and playgrounds remained clean and tidy, it would indirectly get the residents to be responsible of their own areas. Sungei Wang senior promotions and public relations manager K.K. Lim welcomed the idea and said the complex would love to work with the DBKL in adopting areas that were close to the complex. Parkson general manager in charge of Parkson Care Lee Kong Huat said the mayor’s proposal was a good way of getting corporations to contribute to the community. Lee said Parkson had always been interested in such endeavours and that the company had adopted eight parks under its corporate social responsibility programme. 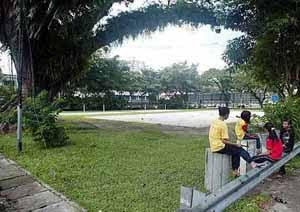 The parks Parkson adopted are Taman Beringin and Taman Bandaran Kelana Jaya in Petaling Jaya, Ipoh Polo Ground Park in Ipoh, Dataran Bunga Raya in Seremban, Taman Jubli Perak Park in Sungai Petani, Taman Kejiranan in Jalan Teluk Sisek, Kuantan, Kajang Municipal Council Children Playground in Kajang and Taman Datin Rokiah in Taman Century, Johor Baru. “We have always been interested in adopting KL parks. “In fact, we wanted to adopt the Lake Gardens and a park in Taman Desa and areas in Taman OUG,” Lee said. Lee added that apart from funding the parks, Parkson staff were encouraged to get involved in sprucing up and restoring the park and its facilities. Fuad added that a committee would be set up to formulate policies and programmes to develop a system to enable corporations to adopt the areas. Defiant: The owner of this restaurant in Jalan SJ1 in Taman Selayang Jaya had been fined many times but still operates the outlet. 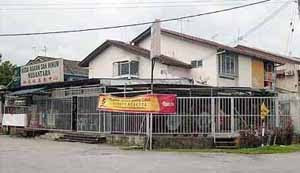 Two double-storey houses in Taman Selayang Jaya, Selayang, have been converted into restaurants and their neighbours are unhappy about it. Both the restaurants are corner lots — one in Jalan SJ19 and the other in Jalan SJ1. Although one of the restaurant owners had been fined numerous times by the Selayang Municipal Council (MPS), the operator continues to run the outlet in defiance of the local authority. Residents, who wished to remain anonymous, sent an e-mail to StarMetro claiming that these restaurants were disturbing the peaceful environment and led to vehicles being parked along the road, sometimes even blocking the entrance to their houses. A check revealed that extensive renovations had been done at the double-storey steamboat restaurant in Jalan SJ19 —even the addition of a third floor — and the council was unaware of it. The other houses along Jalan SJ19 are double-storey houses. MPS assistant enforcement officer Paramasivam Chelliah said the restaurant in Jalan SJ1 had been fined many times. Each time, the owner will just pay the fine and continue to run the business. “We are unaware of the restaurant located in Jalan SJ19. “Our enforcement staff will visit the place next week to check whether they have proper documentation for the renovations and approval for the restaurant. “We do not give any permits for houses in residential areas to be converted into restaurants,” he said, adding that the case was being handled by the council’s legal affairs department.